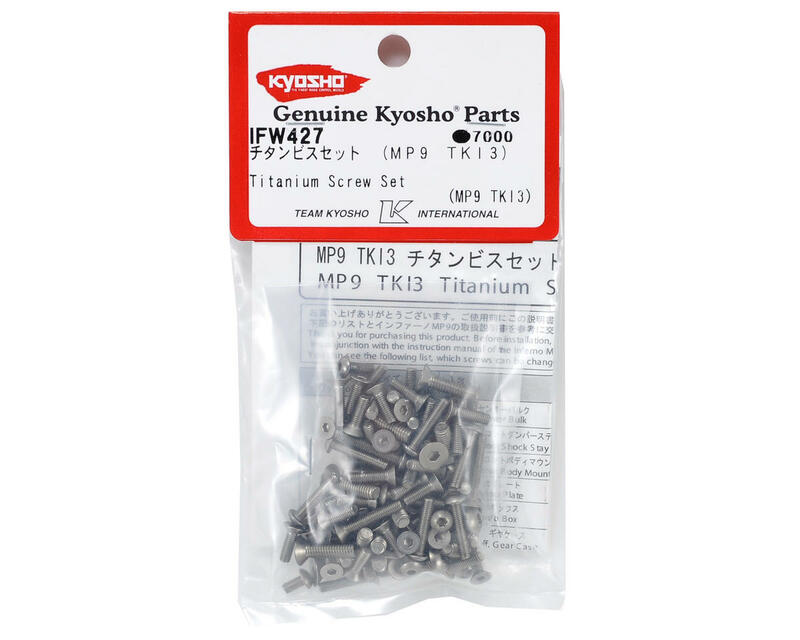 This is an optional Kyosho Titanium Screw Set, and is intended for use with the Kyosho MP9 TKI3 1/8 buggy. This screw kit will help to reduce the overall weight of your buggy, and add a bit of bling at the same time! Includes instruction manual to help with installation. Nice upgrades from those weak stock kyosho screws. Not all screws are included, just parts where is needed. Replacements for the larger screws found in the MP9 TKI kit are not included. Replacing the stock screws with these will result in a weights savings equal to the weight of the screws in this kit. virtually none of the 4mm cap head or button head screws are included. 4mm flat head screws are. 3mm cap screws are not. Most all other 3mm button and flat head screws are. No 2mm or set screws are included. It would be nice if the heavy 4mm screws and 3mm cap heads were included and that would have been 5 stars. Until then, it's 3.5 stars. I'll round to 4. You can still lighten you car by half the weight of all the screws it does replace. Kyosho titanium is good quality. Mugen too.